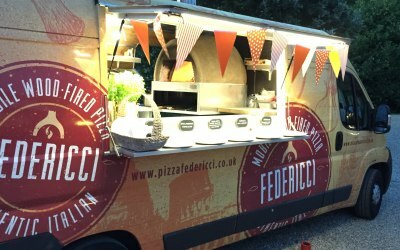 Pizza Federicci is a mobile wood-fired pizza business based in Kent. 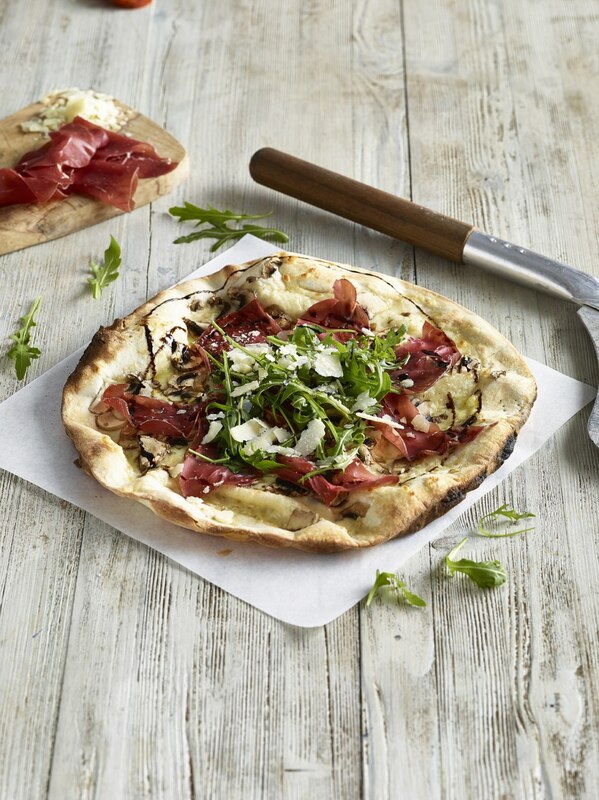 We serve delicious thin crust, authentic Italian pizzas at public and private events, weddings and parties in London and the Home Counties. We love catering at private parties, weddings and corporate events, as well as at school fairs, shows, street markets and village fetes. We provide a thoroughly professional service from start to finish, and do our best to not only satisfy our clients' requests but to exceed their expectations. 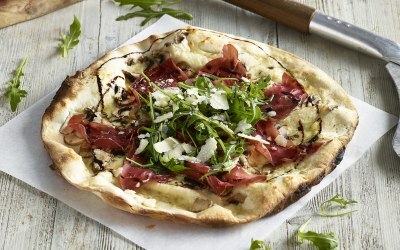 Our customers often say our pizzas are the best they have eaten this side of Italy. Federicci himself is from Rome and trained at the Italian School of Pizzaioli, so he certainly knows how to make a great pizza! 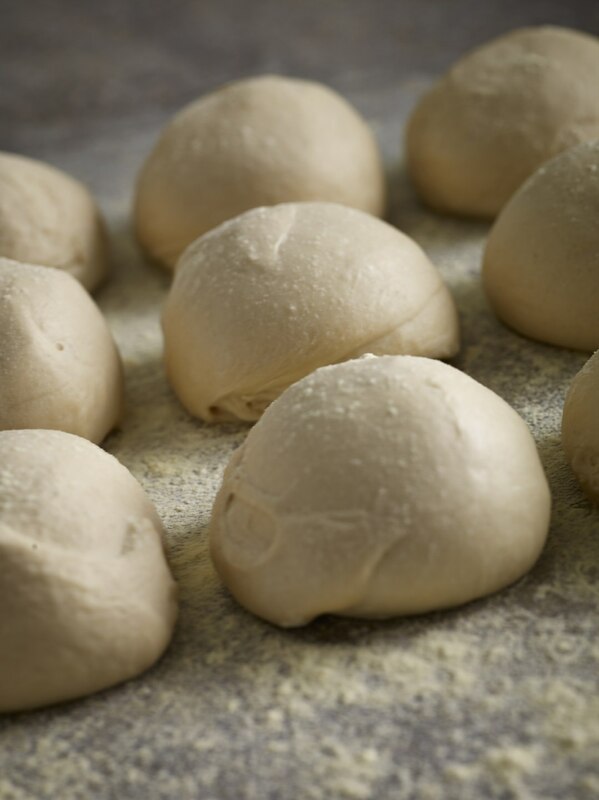 We make our own dough, and use locally sourced produce and imported Italian ingredients to produce a truly authentic Italian pizza with a thin base and crisp crust - no soggy bottoms here! 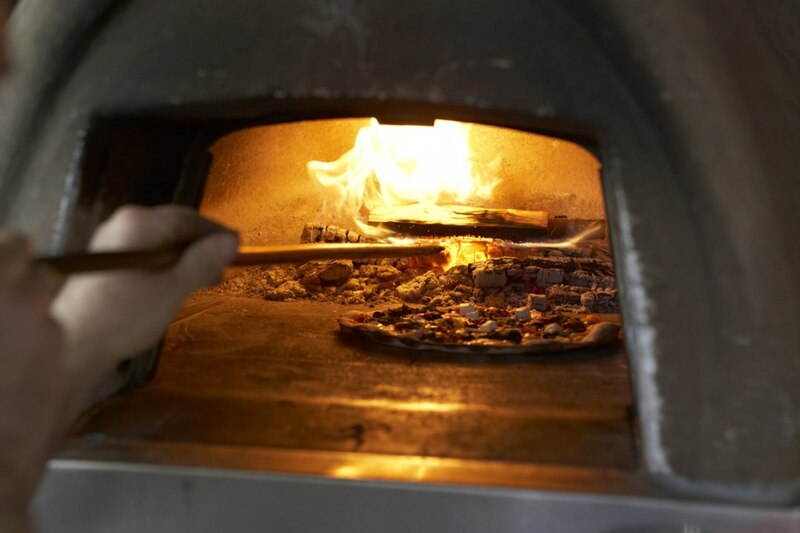 We also offer our own hand made gluten free pizza bases as well as lactose and dairy free cheese and will do our best to accommodate any other dietary requirements you may have. 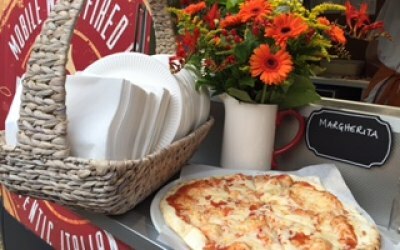 We've made a yeast free pizza for one of our lovely brides and wholemeal pizza bases for diabetic guests - nothing is too much trouble and we'll always go the extra mile to make sure all your guests can enjoy a pizza with you. 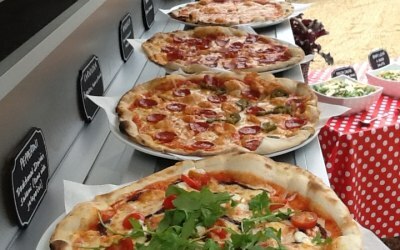 We have three ovens - one in each of our two pizza vans and a larger oven on a trailer. 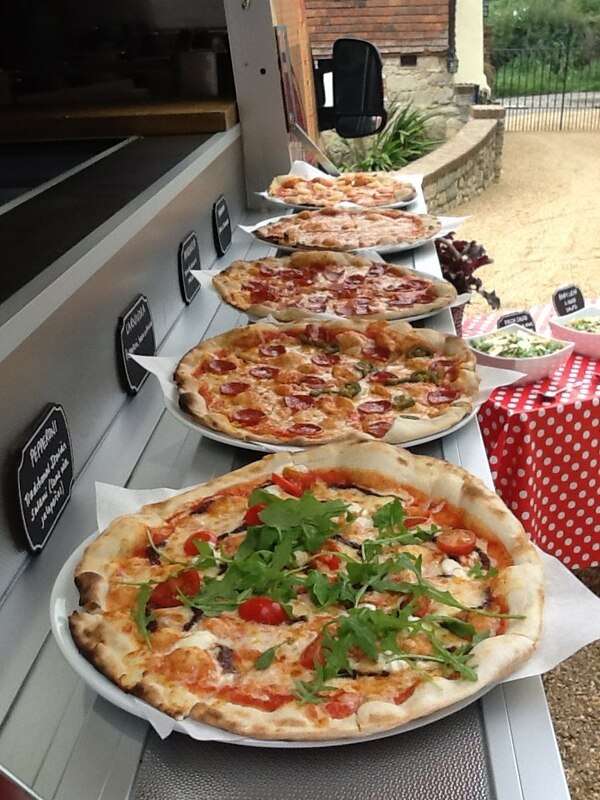 The vans are suitable for smaller events and can cater up to 150 people, while the larger oven, set up with a street kitchen under a gazebo, works well for both small and larger events and festivals. A lot of our work with private clients is for 'landmark' birthday parties and wedding receptions. 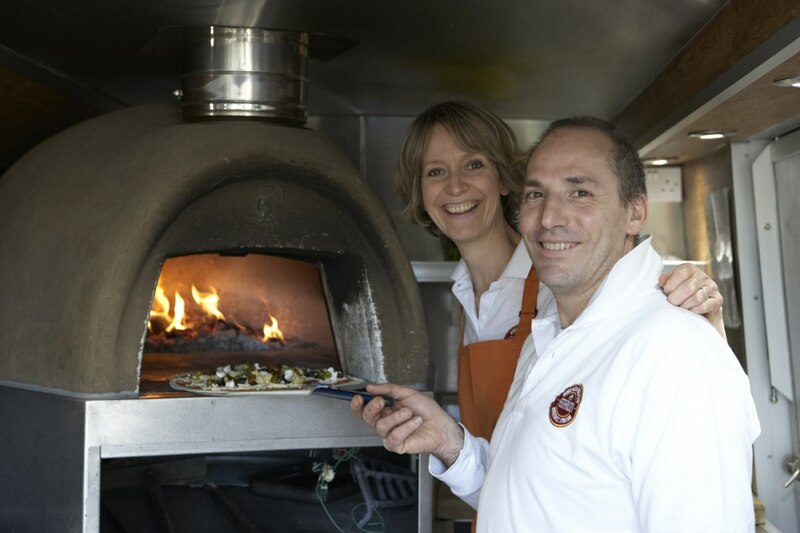 From a small gathering of close family and friends for an intimate 18th, 30th, 40th etc, to a 'no holds barred' celebration for a 21st or 50th birthday, having our pizza van will add a special touch to your party. 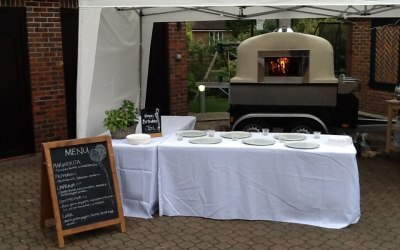 And if you are planning a wedding, a wood-fired pizza van rocking up for your evening reception will always go down a storm! We also enjoy catering at corporate lunches, launches and fun days, as well as at school fairs, fetes and fund-raisers. We have great fun providing catering for Lamborghini Sevenoaks and enjoy working every year at events with a number of private schools in Kent, London and Surrey. Established in 2013, we have plenty of experience catering at all kinds of events and would be delighted to discuss your event and help you with the planning process. Please contact us to see how we can add a fun and unique element to your special occasion. Very tasty pizzas, and lovely people. Vinita, thank you for your kind review and recommendation. We are really pleased to hear that you were happy with our service and that the feedback from guests about the pizzas was so good. Sorry to hear that you didn’t manage to get any - we hope there will be another occasion when we can make pizza just for you! 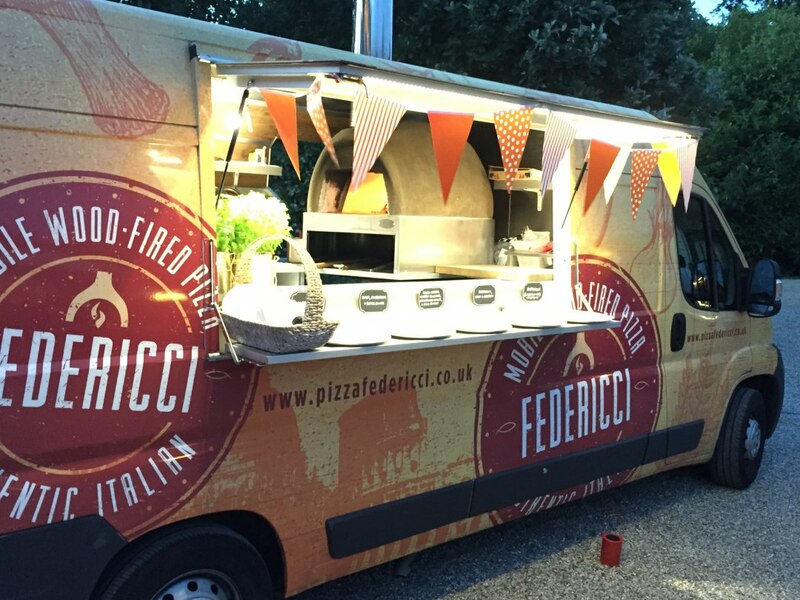 Thank you once again for booking Pizza Federicci - it has been a pleasure planning the party pizzas with you and the team enjoyed serving everyone on the evening. I can not recommend Pizza Federicci highly enough. We hired them for our daughters first birthday party. Right from the very start we found Julia and her team to be incredibly friendly, professional and approachable. I had sent Julia several emails and always had a very prompt and detailed response. Nothing was too much trouble for them, including accommodating a few of our quests with various dietary needs and allergies . On the day Fede arrived on time and was ready for service as soon as our guests arrived. 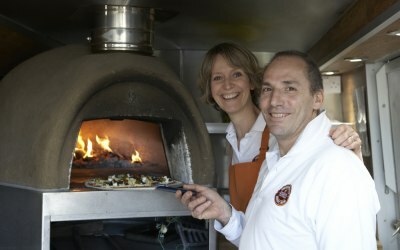 Everyone absolutely loved the pizzas including our intalian guests!! Thank you pizza federicci for making my daughters first birthday extra special! 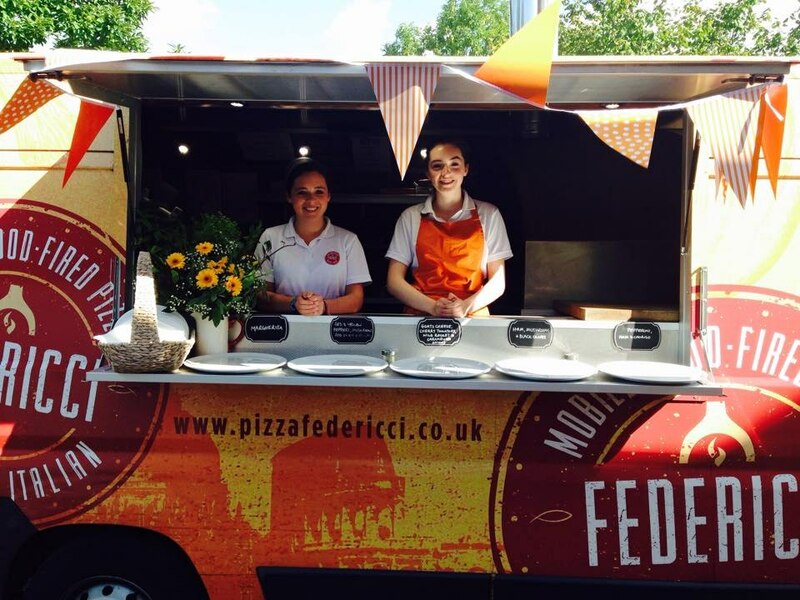 Pizza Federicci catered for our evening food at our wedding in September. Julia was fantastic to arrange everything with and Fede cooked them beautifully on the evening. They arrived and set up without a problem and the Pizza's were great, they were so flexible and even helped to accommodate for one of my guests who cannot eat cheese. I would recommend using them and would definitely book them again in the future. Could not recommend Stefan and the team more. A joy to have at the party, incredibly polite, kind friendly and DELICIOUS pizzas. Book them- you shall not regret it! Julia and Lorenzo were amazing at our wedding, and I am so glad we booked Pizza Federicci. Before we even booked, Julia provided a really competitive quote for what we needed, with excellent communication skills and was just friendly and professional which is what you want in a vendor. Julia told us exactly what we needed to know, when we needed to know it and asked the right questions. At the event itself, she turned up early and introduced herself. All very low maintenance. 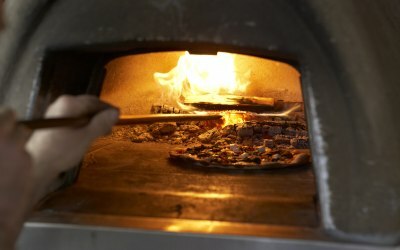 Van looked awesome with the little wood fired oven, super clean and had nice touches like the basil in pots. Pizza was so crispy and delicious...thanks so much Julia! Dear James and Rachel, thank you so much for your thoughtful review - we really appreciate you taking the time to post and are so pleased to hear that you were happy with our service on the night and in the planning stages. It was a pleasure to work with you and to serve you and your family and friends. Thank you once again for booking Pizza Federicci for your evening celebration and from all the team here, we wish you every happiness for the future. Thank you so much, the service was great and the Pizza was just wonderful. I would recommend to anyone. Hi Hannah, thanks so much for taking the time to leave a review for us. 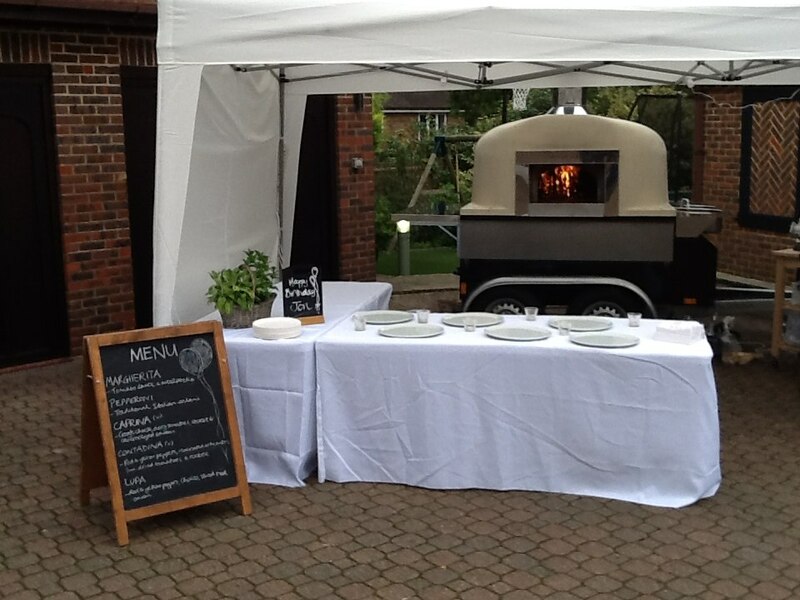 We are really pleased that you were happy with our service and the pizzas on the evening of your wedding. It was lovely to meet you and all your guests and we wish you every happiness for the future. Thank you once again for booking us for your evening catering and for your kind recommendation. 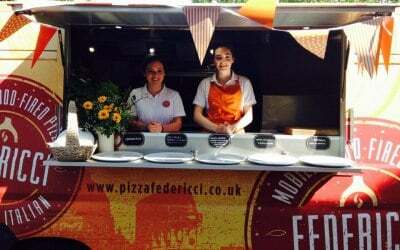 Pizza Federicci provided stone baked pizza's at our Wedding Reception. All our guests loved them and they went down a storm. Company were so pleasant to deal with from beginning to end and we could not recommend them enough. Thank you Alyson for your review and recommendation - we are really pleased that the pizzas went down so well with all of your guests and that you were happy with the service provided. Stefano and Lorenzo enjoyed making pizzas for you all. Thank you for booking Pizza Federicci for your special day and from all of the team, we wish you every happiness for the future. We were thrilled with the quality of the pizzas, they were amazing, we even got to keep the last few pizzas which were promptly demolished! Everyone loved it and said how great it was! 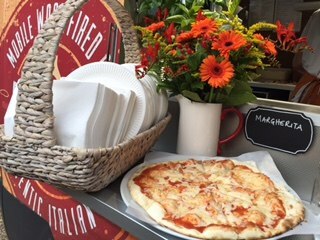 Thank you Lauren - we are so pleased that you and your guests loved the pizzas at the evening celebration of your wedding. Fede and the team had fun making pizzas for you all. Thanks so much for booking us and for taking time to post a review. We hope you had a fabulous wedding day and wish you every happiness for the future. Thank you Clare - we are delighted that you were happy with everything and that the pizzas went down well with the party guests. Sorry you didn't have any left over for the next day! It was a pleasure to serve you and we look forward to making pizzas for you all another time. Thank you once again for booking us for this special occasion. 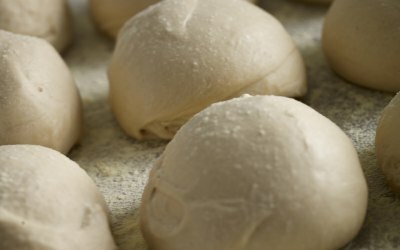 Get quotes from Pizza Federicci and others within hours.